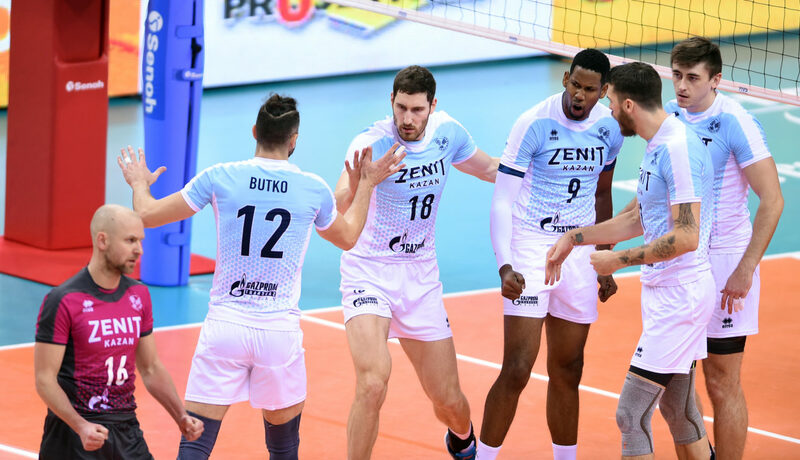 ST. PETERSBURG – To avenge one of their two losses in the Russian Superleague, the juggernaut Zenit Kazan won all three matches in the three-leg championship series over Zenit-St. Petersburg. The third match was competitive, but the ten-time Russian champions prevailed, 25-21, 25-22, 25-22 in front of a record 7250 in St. Petersburg. Kazan were led by opposite Maxim Mikhailov with 21 points on a team-high 15 kills, a match-high 4 aces and 2 blocks. Cuban outside hitter Wilfredo Leon finished with 16 points on 14 kills, an ace and a block. American Matt Anderson finished with 7 points on 6 kills and an ace. For the young home squad, a first-time attendee at the Russian Superleague Championship Series, Cuban outside hitter Oreol Camejo finished with 18 points on a match-high 17 kills and 1 block. Serbian opposite Drazen Luburic and former Kazan outside hitter Evgeniy Sivozhelez finished with 7 kills each. For ZSP, their season is complete, looking at the possibility of returning all of the main players from their second-place squad. Zenit Kazan‘s season continues, as they look to host the Champions League Final Four on May 12-13. Their semifinal match is against Italian champion Sir Sicoma Colussi out of Perugia at noon eastern time (7 p.m. local time). Kazan’s overall record stands at 51-4, and they have not lost a match since January 7 at Belogorie in five sets.